If you need a KV-F510 with a KV-F511 printer-scanner unit attached and 3.5 inch optical driveF service, then contact our friendly company. 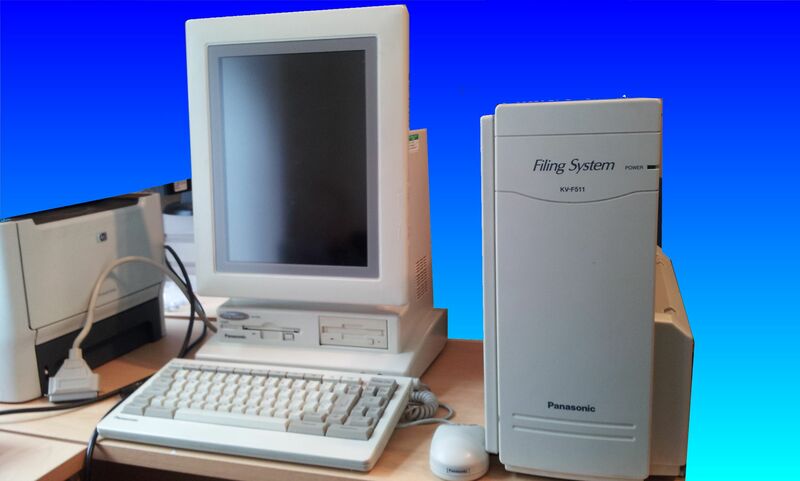 Panasonic Electonic Filing System (also known as Fuji X D File) KV-510 with a KV-511 printer-scanner unit attached and 3.5 inch optical drive. The KVF510 and KVF511 was used to capture scanned images and store them while replacing traditional filing cabinets. The big problem is that your data is now stored in a proprietary filesystem, with documents encoded / encrypted on the MO disks and Optical Disks. However no need to panic - simply contact us to export the files to allow import into your new document management system such as lasefiche, docxp, pcdoc etc.